This week has not been the most stress-free at work, and today was particularly trying. 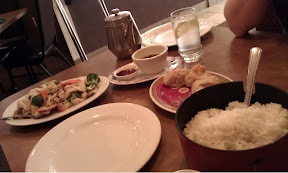 In an attempt to lift change my mood (and because there was no way I was cooking anything tonight) we ate out at a local Chinese food restaurant. Well, I ate. That whole spread? That's all mine. That looks so good! I love chinese food (although I don't eat meat or dairy any more).